Codpieces were not an invention of the renaissance. Simple codpieces have been found on figures excavated at Knossos on the Minoan island of Crete. have a well thought out and researched marketing plan before you begin to spend your budget. don’t start spending money on advertising until you have at least three books out there. So far, there have been two other Amazon Academy events on this side of the pond: one previously in Dublin and this one in London. And there will be one more in Newcastle coming soon! After that, Amazon will review feedback to see if they will do it again and I, for one, hope they will. These are a beautiful quotes, especially Mother Theresa’s “Love until it hurts” and a wonderful way to begin the New Year for only love can heal all hurts and hearts. This is a delightful post, insightful, hysterically funny, and in my opinion, well written. I wrote this a few weeks ago and for reasons soon surely evident has been taken to being called “Why, Apples?” in “the biz.” I do like that title, I’m afraid, but since I’m one of those crazy guys, I felt the title had to inspire terror and act as a warning… while also delivering on its promise (the idiot). Alicia was my first experience in real Christmas giving, the kind that involved the whole family and money. One hundred dollars- a fortune for a preschool teacher back in the late 80’s. It was a Christmas gift that changed my family. They didn’t know Alicia, although I often talked about the children in my preschool class. Alicia came into my class with issues; she had spent much of her first year of life in a baby seat. Her mother had special needs and never knew that holding a baby, talking with a child, and letting a baby play on the floor were important to a child’s growth. Never mind reading-aloud or playing with toys- those activities were far away from Alicia’s world. 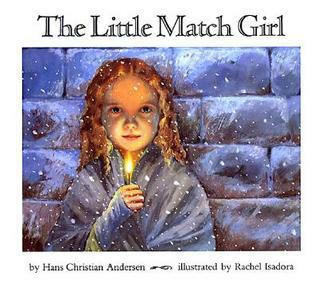 At this time of year, I think of The Little Match Girl fairy tale by Hans Christian Andersen. “It was terribly cold. It had snowed that day and it was almost dark”, begins the story of The Little Match Girl who carried with her a little box of matches to sell, but no passerby had stopped to give her even a penny as she walked along, hoping for someone to buy her matches for a penny, but no one even glanced her way. The Little Match Girl was so terribly cold and her thin little body ached with the cold. She had no coat or shoes. Her old hand-me-down sweater was soaked through from the snow that had fallen earlier in the day. She shivered uncontrollably as the snow started falling again. She saw a place between two houses where she could sit down and look across the street. There she saw warm yellow lights from windows. She thought she could even smell the holiday goose that was headed for the dining table. She was so weak from the freezing cold and so hungry she could no longer stand again, so she took one of the matches and lit it and she began to feel warm and then she lit another one. She knew she dared not go home, her father would beat her. She began to dream of her grandmother and lit another match, but this time all the matches came aflame. To her it was like heaven with the sky ablaze and she saw her beloved grandmother as she watched as a star fall from the sky. She remembered what her grandmother told her, when a star falls a soul goes to heaven. “Take me with you Grandmother” she cried, and her grandmother picked her up and flew to heaven with the tiny Match Girl in her arms. The next morning, the little Match Girl was found frozen to death on the street corner where no one had stopped to give her even a penny. This is more than a fairy tale, it is real because around the world there are many little Match Girls and Boys and they are dying for want of a little kindness from those of us who have shoes, warm coats and Christmas dinner waiting.